The rapid rise of San Francisco between 1849 and 1856 engaged the attention of contemporary nineteenth-century observers and subsequent historians. In that period, San Francisco grew from a small village of a few hundred to a city of thousands. It also became the principal American port on the Pacific Ocean. Interpretations as to how and why the city grew into this role vary, although all accounts note the role of the discovery of gold in California and the subsequent "Gold Rush" as causative factors (for example, Taylor 1850; Capron 1854; Soulè, Gihon, and Nisbet 1855; Hittell 1878; Bancroft 1888; Eldredge 1912; Caughey 1948; Lotchin 1974; Holliday 1981). Previous to the year 1848, the wildest imagination could scarcely have conceived that a large and populous city would suddenly arise under the flag of the Union on that remote and alien shore; or that the waters of that silent harbor would be whitened with the canvas of every nation, and be vocal with the restless commerce of the world. But enterprise is not now the tardy nag it was forty years ago; the sentiment "perseverantia vincit omnia" is not, at this day, a merely literary flourish or theoretic idea, but is a practical fact; and its truth has never been more signally illustrated than in the history of San Francisco—a history that has no parallel in the annals of the world (122–123). Capron suggests that San Francisco was an accidental city propelled into greatness by an enthusiastic, international maritime capitalistic response to the discovery of gold in California. He is correct in part, but as I suggest in this book, the rise of San Francisco was far from accidental. Gold was not an instigator, but an accelerant, to development. The remote and alien shore Capron describes was neither. Connected to preexisting Pacific and global maritime trade and commerce, San Francisco was not a frontier in any traditional sense; it was part of a maritime frontier (Gibson and Whitehead 1993). The Spaniards had scarcely proceeded any way in the great work,—if they had not rather retarded it, when the Anglo-Saxons, the true and perhaps only type of modern progress, hastily stepped in, and unscrupulously swept away both their immediate forerunners as effete workers, and the aborigines of the land, all as lumberers and nuisances in the great western highway of civilization. This highway is fated to girdle the globe ... and there need not be the slightest doubt but that the empire, or rather the great union of peoples and nations in the Pacific will soon—perhaps in fifty years, perhaps a century—rival, if not surpass the magnificent States of the Atlantic. Indians, Spaniards of many provinces, Hawaiians, Japanese, Chinese, Malays, Tartars and Russians, must all give place to the restless flood of Anglo-Saxon or American progress (Soulè, Gihon, and Nisbet 1855:53–54). Not only are Japan and China much nearer to the California coast than India is to England; but with the aid of steam the time for accomplishing the distance is immensely reduced ... So it was with the English in India; and so it may be with the Americans in China. Just give us time. England has not been very scrupulous in her stealthy progress over Hindostan, Ceylon and Birmah. Then neither need America fear her reproaches, if she, in like manner, conquer, or annex the Sandwich Islands, the Islands of Japan, those of the great Malayan Archipelago, or the mighty "Flowery Empire" itself. A few more years, and a few millions of Americans in the Pacific may realize the gigantic scheme ... The railway across, or through the Snowy and Rocky Mountains, which will bind all North America with its iron arm into one mighty empire, will facilitate the operation. And then SAN FRANCISCO—in the execution and triumph of that scheme, will assuredly become what Liverpool, or even London is to England, and what New York is to the Middle and Eastern states of America—a grand depot for numerous manufactures and produce, and a harbor for the fleets of every nation (Soulè, Gihon, and Nisbet 1855:54–55). The establishment of American governance and the subdivision of the town's public lands for private sale were the first steps in creating the entrepôt that would facilitate the development of the port. The discovery of gold in 1848 and the "rush" that began in 1849 abetted and accelerated this process. The Gold Rush provided more than large amounts of gold for capitalization, a requisite aspect of the town and port's development as it constantly rebuilt after a series of disastrous fires. The Gold Rush provided a market and a start-up role for the new entrepôt as it served the needs of the mines and miners who came for gold. Holliday discusses how San Francisco's geographic placement made it the "Great Commercial Emporium of the Pacific" (1999:182). The city's location on the shores of the region's greatest harbor, on a bay into which flowed two major rivers that penetrated deep into the surrounding country, guaranteed its role as the landing place for thousands of passengers and cargoes. By 1850 San Francisco was a port "secure in its monopoly by the luck of geography," its rise assisted "by the driving ambitions of its businessmen, who worked to connect their port with the vast inland mining empire, mother lode to the city's prosperity' (182). The primary means of supply was by ship, with vessels calling from around the globe. Thousands of vessels arrived at San Francisco between 1849 and 1856, discharging thousands of passengers and more than half a million tons of cargo (Delgado 1990a). A variety of global partners with commercial, not political, interests at stake abetted this trade. The first step toward creating a successful entrepôt was to build a unique waterfront that used ships as floating buildings, wharves as streets, and buildings on pilings into which goods could flow from around the world. On this quickly built waterfront, the entrepreneurs of the time hastened to sell or repackage these goods and transship them to the interior of California and the gold mines. Thus lay transformed San Francisco, from an expanse of sand hills, from a tented encampment, to a city unapproached by any of similar age for size and for substantial and ornamental improvements ... The fluctuating settlement stood now the acknowledged metropolis of the west.... and this phenomenal progress was the achievement of half a dozen years, surpassing the wildest of those speculations which had incited, first the entry of the pioneers, then annexation by the United States, and finally city building, and the founding of an empire out of the manifold resources ... A series of surprises marked the advance of the state as well as of the city—the one a wilderness bursting into bloom, the other a mart of progress purified by many fiery ordeals (1888:787). This new city, outpost of American ambitions on the Pacific, had not only rapidly evolved, but it had done so in a way that did not fit the traditional frontier process. The traditional frontier process, as proposed by Turner (1894), was marked by waves of exploration, trapping and trading, and farming and settlement by "men of capital and enterprise" who built villages that finally grew into towns and cities. Later Billington (1956) modified Turner's model of slow and steady westward movement, proposing that as the movement gathered pace, "a standardized zonal pattern" of settlement emerged. The resulting zones were the domains of fur traders, cattlemen, miners, pioneer farmers, and equipped farmers; the "final frontier zone" was one of town and city (3–6). The founding of towns and cities, in Billington's model, came with the arrival of entrepreneurs and opportunity seekers who "chose their homesites at strategically located points in the center of agricultural communities, usually selecting a crossroads, a point in the head of navigation on some stream, or an advantageous spot on a canal or railroad. As more and more concentrated there, a hamlet, then a village, then a town, gradually took shape" (306). However, San Francisco, isolated by the landmass of the continent and the mountain ranges of the Midwest, was not linked to the rest of the United States by land. Reps, in his study of frontier processes, challenges the Turner and Billington models. Noting the earlier tradition of Hispanic town planning and settlement and the "simple truth ... that in every section of the West, towns were in the vanguard of settlement," Reps suggests that frontier towns were laid out as planned communities with designs for future growth (1981:2). This framework provides a better one for understanding San Francisco. Reps specifically rejected the agrarian emphasis of Turner and Billington, arguing that a variety of factors induced migration to the frontier, including mining, urban speculation, railroad building, and pioneers' desire to escape religious intolerance. In this view, Reps followed Paul (1963), who argued that the discoveries of gold and silver in the nineteenth century resulted in a series of detached frontiers. His argument also fits with the theoretical premise of Steffen (1979), who examined processes of settlement and broke down change into two patterns: modal change, a slower, minimal process; and "fundamental" change, a process that significantly disrupts the status quo. These processes created two models in the United States: the "cosmopolitan frontier," a modal change, with a large number of interacting links; and the "insular frontier," a fundamental change influenced by indigenous environments, with few interacting links. The mining activities of the nineteenth century, argued Steffen, did not create a frontier in Turner's sense but a continuity of "national trends that occurred in the decades before the initial rush to California" (110). One of those national trends, beginning in the 1780s, was the American push into the Pacific to seek new avenues of maritime trade. By the nineteenth century, American commercial, military, and cultural interests were flooding into the Pacific and dominating the Pacific Basin's oceanic trades (Gibson and Whitehead 1993:6–9). I suggest that San Francisco is an artifact of the maritime system at play in the Pacific in the first half of the nineteenth century. Thanks to ships and shipping, San Francisco tied into a web of international relationships and trade to become America's principal seaport on the Pacific and a participant in the global economy. My study of archival sources and the material record of the Gold Rush waterfront of San Francisco in the late spring of 1851 confirms that San Francisco, as Reps suggests, was a planned town. At that time, San Francisco was in transition, evolving rapidly from a small village into a major port and entrepôt, and the waterfront was a carefully planned aspect of that expansion. To the modern eye, the Gold Rush waterfront is a vanished landscape. However, because of a series of catastrophic fires, landfilling, and urban development, the waterfront of 1849–56 survived, albeit as a buried archaeological resource. A number of the ships, wharves, and other infrastructure of San Francisco's Gold Rush waterfront lie buried beneath the streets, sidewalks, and high-rises of the modern city. Indeed, the tide still rises and falls on the beaches of 1849, albeit percolated through a thick matrix of mud, sand, and rubble. The macroartifact that is the entire waterfront has been discovered during downtown construction and documented through decades of archaeological excavation and investigation. To sample the Gold Rush waterfront, I have participated in the detailed excavation and analysis of a Gold Rush floating warehouse—in contemporary terms, a storeship— General Harrison. By comparing the data on General Harrison with the results of earlier excavations of other storeships, particularly the neighboring Niantic, I have been able to fill in some data missing from the General Harrison site. In turn, I have been able to assess the representative nature of the General Harrison site and its assemblage within its neighborhood. A comparison of two other contemporary sites—Hoff's Store and another, unidentified store or stores at 343 Sansome Street—enhances this analysis. The archaeological sites of Hoff's Store, 334 Sansome, Niantic, and General Harrison are in close proximity, and all four were "destroyed" in the cataclysmic fire of May 4, 1851. Obtaining a precise dating of the archaeological deposit containing all four sites has been particularly important because the next level of analysis, after examining the physical characteristics of each site and their role in the planned development of the town's port, focuses on the material culture (cargo) of General Harrison. In this cargo I have looked for evidence of the global patterns of maritime trade. San Francisco was not an ideal candidate for future growth: it was hemmed in by tall sand dunes, and its shallow waterfront became an expansive mudflat at low tide. Unlike other Spanish settlements, which began as walled or easily defended citadels, San Francisco began with a plat that laid out streets on an open grid for future commercial growth. This initial plat, created in 1839 and extended by the Americans in 1847 and again in 1849, is a graphic artifact of the triumph of political maneuvering over commercial development. The city's plat, described by a newspaper editorial in 1855 as proof of "the jealous avarice of the city projectors into turning every ... square [yard] ... of the site, into an available building lot" (cited in Reps 1981:112) was squares of land for speculation without public spaces. This purely commercial emphasis prompted quick improvisation of an extensive infrastructure. The resulting dynamic urban environment was characterized by frequent change and a hectic pace of life, specifically on the waterfront (Barth 1975:130). The development of the waterfront defined early San Francisco economically as well as physically, generating an urban, commercial, and mercantile core that allowed its developers and inhabitants to thrive in the face of competition and prosper despite the lack of available land, boom-and-bust economic cycles, and a series of destructive fires. The founders of San Francisco were capitalists gambling on San Francisco's becoming a point of transshipment of goods off-loaded from deepwater oceangoing craft into smaller bay and river craft that could navigate the bay and its connecting San Joaquin and Sacramento rivers to deliver their cargo to the mining settlements in the mountains (Barth 1975:139). Lotchin also cites this creation of a "transportation break" as the key to San Francisco's success (1974:6). Though maritime in nature, this transportation- and transshipment-based origin of San Francisco is similar in some respects to the role of the railroad in other frontier settlements, particularly in the development of another "instant city," rail-linked Denver, Colorado (Barth 1975). The story of commercial maritime influences on San Francisco's creation and ongoing survival complements "the other great nineteenth century American narrative about the articulation of private commerce, public government, land speculation, transportation technology, infrastructure, power, and transformation of urban form, particularly on some given frontier.... [as well as] the story of railroad development in the country" (Purser 2003a). San Francisco became the city it did simply because of maritime capitalists' desire to tap into global maritime trade. Economic historians Eric Jones, Lionel Frost, and Colin White note that the first effect of the gold-fueled rise of San Francisco was "to link the regions of the Pacific Rim more closely with metropolitan centers in Europe" (1993:66). The development of the city also marked the commencement of a new and expanded pattern of transpacific and coastal Pacific trade. Anglo-American Pacific trade had previously existed on a smaller scale thanks primarily to the China trade and whaling. The Gold Rush changed this trade scenario. As Jones, Frost, and White point out, in the nineteenth century, the center of the global economy "clearly moved from Western Europe to the United States" (1993:5–6). I believe that the major factor in this shift was America's ability to dominate Pacific trade thanks to the Gold Rush and the rise of San Francisco. The intermingling of mariners in regularly arriving ships and the influx of miners in pursuit of goods, services, or simply respite from the harsh winters of the mountain camps made San Francisco a hub of trade and a core of the communication network. From here, "investment capital, knowledge, and personnel moved into the mountains and dividends, experience, and information about the West returned to the east" as well as Europe (Barth 1975:209). Not coincidentally, also at this time, "oceanic routes integrated the world economy as never before.... [worldwide] rapid growth and revolutionary change in transportation and communications increased the output and trading of goods ... [and] shifting patterns of international trade across the North Pacific further stimulated commerce" (Perry 1994:61). To tap into this emerging Pacific trade, San Francisco needed quickly to establish a proper zone of commercial maritime exchange on the waterfront. "Wedded to maritime trade," San Francisco's residents, as Barth suggests, spotted the solution to the emerging town by transforming the shoreline into the heart of the business district (1975:210). Barth identifies these resident developers, as a "new breed of speculators, responsive to the hectic pulse of the changing city" (211). Lotchin (1974:9) also describes the quick development of commercial facilities on the waterfront, quoting contemporary journalist Bayard Taylor's observation that whatever advantages San Francisco lacked for success as a transshipment point "will soon be amply provided for by wealth and enterprise" (1974:9). Those with the means to develop San Francisco were the merchants with strong international ties to maritime trade, most of them commission merchants with preexisting business arrangements in Central and South America, China, the eastern United States, and Europe. Lotchin (1974:52) places them at the top of the economic food chain of Gold Rush San Francisco because they essentially controlled the city's trade through their handling of incoming goods. Their role in building up San Francisco, largely on their own initiative, was abetted by a weak government presence. Vigilantes drawn from the mercantile elite dealt with lawlessness. Lack of coin was remedied by the establishment of private mints, and "solutions to other problems were often provided within a context of free market operations rather than reliance on government" (Jones, Frost, and White 1993:90). No strangers to the frontier process, commission merchants had played a significant role in developing the Mississippi Valley frontier before the California Gold Rush. In San Francisco, commission merchants had access to an undeveloped waterfront, which, developed to their specific needs, became the locus where goods were quickly off-loaded, safely stored, or rapidly sold and reloaded for transshipment. By tapping into the gold of California, they literally had unlimited means to create such an entrepôt. This circumstance was unusual in world history and was repeated only one other time in North America, in Denver (Barth 1975). However, unlike Denver, the instant city of San Francisco, whose trade links by sea offered a seductive alternative to the vastly more difficult overland routes, did more than draw the American frontier westward. It realigned Pacific and then global maritime networks of transport. This international trade linkage made San Francisco a "cosmopolis" and a "world city" from the start, much like Venice, Amsterdam, or St. Petersburg (211). Miners came to California from various lands or states, driven by economic or social circumstances to try their hand in the mines. Merchants, nonetheless, were the instigators of settlement and development who maintained the lines of trade as part of an interlinked global network. Merchants tapped the energy of the Gold Rush to create San Francisco, further tying the Pacific into the world system. Despite longstanding American desires to dominate this shift in the focus of trade (Perry 1994), the effort was a global one, particularly demonstrated by the relationships of commission merchant ands their backers with commercial interests in London, Hamburg, Paris, and ports in diverse spots such as Hawaii, Denmark, Sweden, and Portugal. The internationalism of Gold Rush San Francisco was no accident, and like the city itself, it grew out of the use of maritime trade to transform the Pacific from a peripheral trade zone to a nexus of world trade. Since the 1970s, as historians rejected the Turner model of the frontier and looked in new directions (known as the new western history), the application of historical or text-aided archaeology (Little 1992) has helped create a new model of the frontier. Particularly significant has been Hardesty's argument that a mining community on the frontier was an urbanlike organization "loosely integrated and atomistic, cosmopolitan, male-dominated, marked often by dramatic boom-bust fluctuations in population size, and with economic and political dependencies upon large scale world systems" (1993:5). I propose expanding this model to recognize the role of the global maritime system (a subset of the world system), which had expanded thanks to trade by sea from its fifteenth-century beginnings to well beyond Europe. Maritime trade in the first half of the nineteenth century was rapidly bringing the system to the Pacific Rim, and Gold Rush San Francisco was a key player in that process. San Francisco provides an archaeological sample within a discrete physical and temporal boundary to assess the rapid adoption of global maritime trade to create an "instant port" by designating the city as an entrepôt. Economic historians have noted that "a settlement located at the intersection of major trade routes, at some point where a change in the mode of transport is required ... will be well placed to attract investment in transport facilities and commercial activity" (Jones, Frost, and White 1993:134). San Francisco's entrepreneurs saw their raw and undeveloped city as such a place and invested capital to overcome its physical limitations. They also fought off competing port cities on the bay and sought to lessen the appeal of bypassing San Francisco and sailing directly into the heart of the gold fields. To do so, they used their economic and political clout to seize legal status as a government-enforced port of entry for foreign goods, thus creating the business foundation for their entrepôt. My analysis takes a historical archaeological approach that draws on Hardesty's "features system" (Hardesty 1988, 1993) and on an emergent school of thought that sees the maritime system as a subset of world systems theory (Staniforth 2003; Russell, Bradford, and Murphy 2004) to examine the rise of Gold Rush San Francisco. Such an archaeological assessment is possible because of the decision of San Francisco's founders to construct much of the city's infrastructure over water. The subsequent partial destruction by fire left a rare archaeological matrix, encapsulating the city by deep burial in sediments that provided a wet environment conducive to preservation, even of organic remains. My focus on these inundated and then buried sites with links to maritime activities also fits within the general shift away from the shipwreck and maritime archaeology of recent years toward a more integrative approach that places historical archaeology within the context of world systems theory and new western history. This matrix is a rich archaeological assemblage of tens of thousands of artifacts. When combined with a detailed archival record that begins with San Francisco's major newspaper, the Daily Alta California and continues with other newspapers such as the San Francisco Daily Herald and the San Francisco Bulletin; contemporary written accounts, including business correspondence; and an amazing array of graphic evidence, including maps, plans, drawings and photographs, the total data set offers an impressive amount of material for study. Both sets of data more than adequately meet Deetz's (1977) highest standards for "visibility" and "focus"—offering abundant physical remains and the potential to read and clearly interpret the remains. My field and archival research has spanned thirty years. I have presented some of the results in earlier publications, presenting a historical model that argues for a maritime-oriented frontier process (Delgado 1990a, 1990b). Here I build on that work, following Deetz's and Hardesty's suggested format of study by integrating oral, written, and material sources to interpret the Gold Rush waterfront of San Francisco and by extension, to examine the ways in which this Pacific Rim "frontier port" fits the theoretical model of a global maritime system. This hypothesis of a maritime-driven Pacific context for the world system will no doubt be relevant to other ports and sites, especially those where commercial interests built "new towns" on "made land" for better functioning of the port (as in Valparaìso, Hong Kong, Sydney, and Seattle). I draw archaeological data from four sites, two piling-supported stores and two storeships that commission merchants converted from floating vessels into warehouses in the heart of the Gold Rush waterfront. The ships were part of a fleet of several hundred vessels that arrived at San Francisco during the Gold Rush years of 1849 and 1850. Close to five hundred were laid up, some permanently and others turned temporarily to other uses. Over two hundred fifty were converted into floating or mud-moored buildings, most of them warehouses, linked by pile-supported wharves and structures to create the necessary infrastructure for the commission merchants' transshipment business and commercial exchanges. Without those ships, the rapid rise of San Francisco would have been different and perhaps impossible. The storeships, controlled by the commission merchants, tapped into and focused on the output of an international production sphere, with goods flowing in from around the world. They created a sphere of distribution and economic exchange in the nine-square-block area on the waterfront where they docked. The storeships are the quintessential Gold Rush San Francisco artifact. By intensively studying their preserved cargoes to determine their functions and activities, we can improve our understanding of the city's role in global maritime trade, particularly its interaction with the world system as an entrepôt. Moreover, we can glimpse the workings of the European modern world system as it reached the Pacific in the nineteenth century by looking at these global patterns of maritime trade. These data enable me to address the critical importance of storeships in the emerging economy of the port, specifically the role of the commission merchants. Study of the Gold Rush waterfront sheds light on the more typical aspects of the capitalist world system, especially core/periphery production, supply relationships and trade patterns, and the shipment of market goods (see Russell, Bradford, and Murphy 2004). As such, the waterfront is similar to Hardesty's view of mining frontiers: "Mining colonies were financed, manned, supplied, from the urban centers of America and Europe. Despite their geographical remoteness and small size, the colonies were linked into a vast transportation, communications, demographic and international scale" (1988:1). Drawing from approaches of maritime archaeologists and anthropologists such as Murphy (1984, 1997) and Staniforth (1997), I center much of my theoretical analysis on the concept of the maritime system. I support these scholars' underlying tenet that a maritime-system approach accounts for integrated maritime activities for an event like the Gold Rush. It incorporates all aspects of a maritime world, from ships, shipyards, and waterfronts to activities (Russell, Bradford, and Murphy 2004:101). It looks at interconnectivity, not specific sites or isolated events, and it fits well with the current direction in maritime archaeological studies. As a maritime archaeologist, I have participated in the excavation and analysis of numerous Gold Rush waterfront sites in San Francisco. Reanalyzing these data, including my more recent analysis of the material culture and historical connections of the General Harrison site, has led to my thesis that San Francisco does not fit the traditional pattern of frontier development in the United States. In the chapters that follow, I lay out the theoretical perspectives that have guided my assessment of the creation of San Francisco. I then offer a historical summary of the development of the city and port, paying special attention to the role of the commission merchants. The development of archaeological methodology and field techniques in the excavation of the material record of San Francisco—the subject of chapter 6 and an aspect that has not hitherto been presented—is critical to understanding the historical archaeology of San Francisco's waterfront and understanding why, without General Harrison, the amount of data provided an insufficient sample to develop and assess my thesis. With this foundation, I summarize the material record and then draw my conclusions about the maritime world system's role in San Francisco's creation. Described as a "forest of masts," San Francisco's Gold Rush waterfront was a floating economy of ships and wharves, where a dazzling array of global goods was traded and transported. 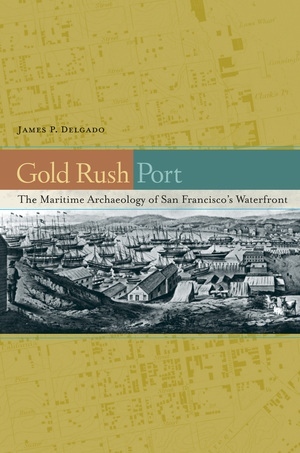 Drawing on excavations in buried ships and collapsed buildings from this period, James P. Delgado re-creates San Francisco's unique maritime landscape, shedding new light on the city's remarkable rise from a small village to a boomtown of thousands in the three short years from 1848 to 1851. 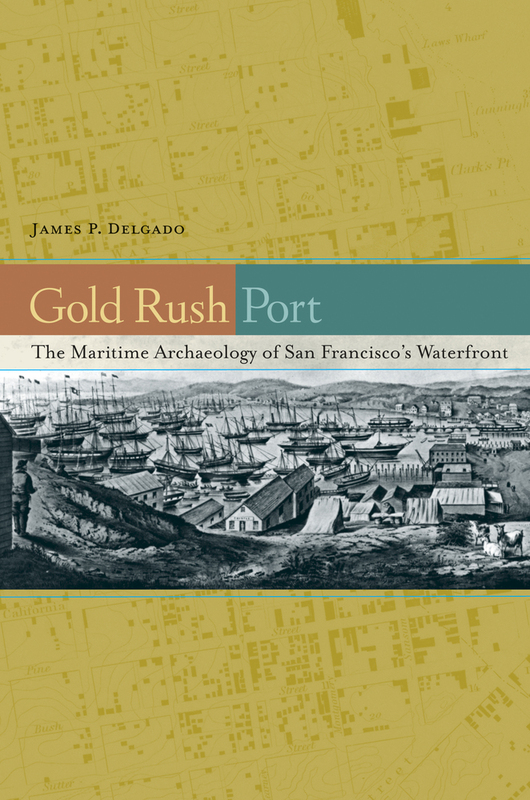 Gleaning history from artifacts—preserves and liquors in bottles, leather boots and jackets, hulls of ships, even crocks of butter lying alongside discarded guns—Gold Rush Port paints a fascinating picture of how ships and global connections created the port and the city of San Francisco. Setting the city's history into the wider web of international relationships, Delgado reshapes our understanding of developments in the Pacific that led to a world system of trading. James P. Delgado is the President of the Institute of Nautical Archaeology. His previous books include Lost Warships: An Archaeological Tour of War at Sea, Across the Top of the World: The Quest for the Northwest Passage, and the British Museum Encyclopedia of Underwater and Maritime Archaeology.